In my spare time (!) I am collecting material for a Dictionary of Phags-pa (Chinese, Mongolian, Uighur, Sanskrit written in the Phags-pa script), which should be ready for publication in ten or twenty years time at the current rate of progress. In the meantime I thought I would post about a couple of Phags-pa inscriptions that I am having difficulty with, in the hope that some of my kind readers may be able to help me out. Ye Qifeng, A General Survey of Ancient Chinese Seals (Beijing, 2003) Fig.77. 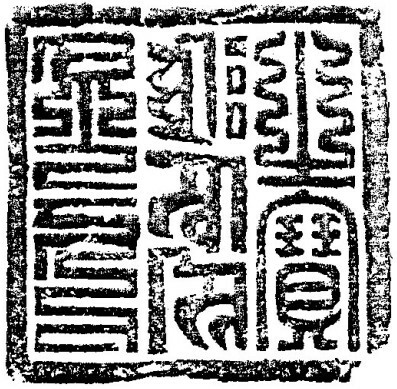 This seal was included by Luo Zhenyu 羅振玉 (1866-1940) in his Sui-Tang Yilai Guanyin Jicun 隋唐以来官印集存 (Collection of official seals from the Sui and Tang dynasties and later), published in 1916, where he interprets the Phags-pa text as reading huang di 皇帝 "Emperor". Reading the left column (Phags-pa) and then the right column (Chinese) this gives the inscription huang di zhi bao 皇帝之寶 "the Emperor's treasure". Whereas, according to Menggu Ziyun 蒙古字韻, xong is the normal Phags-pa spelling for huang 皇 "Emperor" (also huang 黄 "yellow", etc. ), the syllable d-ėi ꡊꡖꡦꡞ that follows it most definitely is not the normal Phags-pa spelling for di 帝. This strange concatenation of letters (DA ꡊ plus -A ꡖ plus Ė ꡦ plus I ‍ꡞ) makes no sense at all. Although in Mongolian and Sanskrit the letter -A can occur medially to indicate a long vowel (e.g. in the word q-an ꡢꡖꡋ "khan", which corresponds to standard Mongolian qaɣan ᠬᠠᠭᠠᠨ), in Chinese Phags-pa orthography the letter -A only occurs initially. Then there is the final diphthong ėi ‍ꡦꡞ, which in Chinese Phags-pa orthography only occurs after the letters KA ꡀ, KHA ꡁ, GA ꡂ and HA ꡜ, and does not occur in either Mongolian or Sanskrit Phags-pa. So the syllable d-ėi ꡊꡖꡦꡞ does not accord to the orthographic rules for writing Chinese or Mongolian in the Phags-pa script, which is very strange indeed if this seal did indeed belong to an emperor of the Yuan dynasty, as you would not expect anyone to get away with a gross misspelling error such as this on the seal of an emperor. If d-ėi ꡊꡖꡦꡞ is not an accidental misspelling for di ꡊꡞ then it must be deliberate, but why I am at a loss to explain. My best guess is that the letters -A ꡖ and Ė ꡦ were inserted into the syllable di as fillers to make up space, so that the line of Phags-pa text filled up the entire lefthand column. However, on Phags-pa seals this problem is usually solved by using complex glyph variants of letters that take up more space than normal, especially the letters i and u which may be written with multiple spirals, so it would have been possible to extend the syllable di by using a convoluted version of the letter i (like ꡊꡞ if you have BabelStone Phags-pa Seal installed). However thrāḥ svā sti is not a mantra either I or Google are familiar with, so if anyone can tell me what it means or suggest a better reading of the Lantsa text I will be very grateful. Almost certain that the first Sanskrit term is the Lantsa from of ksha - क्षाः - which could be representative of governor or "upholder of the earth"
The last may be as it seems, with misplaced ā - as svasti - i.e., fortunate; but could well be a from of svā stha, i.e., self-dependence, sound state, comfort, contentment. Which still does not explain the Phags-pa d-ėi. Thanks for your suggestion. I agree that ksha would be an amprovement on my reading of thrāḥ, but looking at the table of Lantsa letters that I have just appended to the post I don't see any resemblence between the letter in the seal and any of the forms of the letter ksha ... although my six year old daughter says they are similar. I saw your BableStone web page and numerous contributions about fonts, etc. Perhaps you could steer me in the right direction. We would like to prepare typeset Sanscrit texts that will be printed in book form. It will have Devanagari, Lantsa and Tibetan. My question for you is if you know of a typesetting system that will accept transliterated Sanscrit and output Lantsa. What I wish to find is software that can take the transliteration from "Digital Sanscrit Buddhist Canon" and output Lantsa. However, if that is not available, I am definitely interested in any software that can take a transliteration and output Lantsa. Thanks again and congrads on all your contributions and accomplishments! your email: bablestone@gmail.com didnt work. I am afraid I know little about Phas-pa, but after a little reading up and playing around I think that the text does indeed say xong di. The second group seems to include a (possibly poor) attempt to fill space, what you take to be a second and third letter is just a way to get to the fourth and final. This may have been done, avoiding the more complicated variant, to preserve symmetry and an 18 line total, to match the left. This January it was the first time I saw the Phags-pa script in real life: on four stelae in Qufu's Temple of Confucius and Temple of Yan Hui. I took a few pictures and added them to the "Phagspa inscriptions" category on Wiki Commons. You're welcome to use the photos for your project.